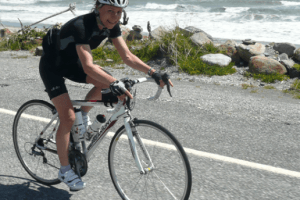 Cycling Tour New Zealand South Island is a once in a lifetime opportunity. The Tour program offers unique features, highlights and some fantastic climbs in the mighty Alps of New Zealand. 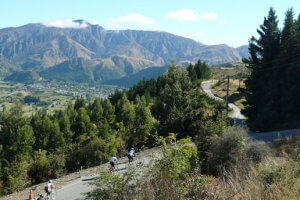 Experience riding the rolling hills of the South Island as you prepare yourself to ride of the “Queen Stage”. 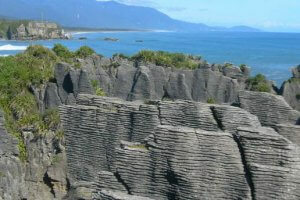 Guided Cycling Tour New Zealand South Island. From January 28 until February 10 – 2019. We also offer a 10-day New Zealand South Island short The Tour starts in Queenstown. 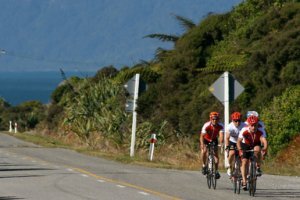 Cycling Tour New Zealand South Island is a once in a lifetime opportunity. The Tour program offers unique features, highlights and some fantastic climbs in the mighty Alps of New Zealand. 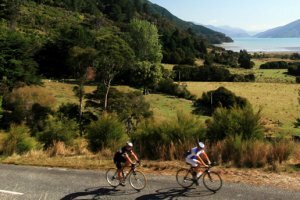 Experience riding the rolling hills of the South Island as you prepare yourself to ride of the “Queen Stage”. From the dry mountains of Central Otago to the rainforest of the Wild West coast! The tour has been specially designed with you, the passionate road cyclist in mind! The tour is open to cyclists of moderate to intermediate fitness level wishing to push themselves and experience new highs of achievement. Routes may include longer climbs and more technical skills. Beyond the included activities their is also some wonderful optional activities for you to choose from. On your free day in Franz Josef you can choose to book a half day hike on the Franz Josef Glacier or you may even go for a helicopter ride! Please make your way to New Zealand's southernmost domestic airport at Invercargill, where you’ll be met by your guide and transferred to your Invercargill (or Bluff) hotel. After assembling your bikes, or being fitted to your hire bike, you gather for a drink and pre-tour briefing before getting to know each other during the evening. You first day’s cycling begins with a 30 km drive to the port town of Bluff. 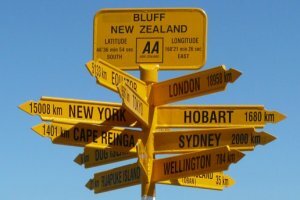 Bluff is at the southernmost point of State Highway 1, New Zealand's longest road (2047 km). You have a leisurely 100 km biking ahead, first on the main road and then on quieter pastoral back roads. The terrain is reasonably flat and a good warm-up for longer rides ahead. You’ll have a late lunch in Gore, a important rural servicing town in this agriculture-dominated region. You ‘up the pace’ today with one of you 3 biggest cycling days. You'll see a dramatic change in scenery from Southland's green pastures to dry, barren Central Otago. As you cycle from the Blue Mountains through a gorge to the foot of the Old Man Range, you pass old gold mining areas and hydroelectric stations. The route is undulating with steeper climbs to test the legs as you approach pretty Alexandra by the Clutha River. Alexandra is New Zealand's hottest, driest, and coldest town. Lunch included. An easier, flatter day’s cycling today. You pass Lake Dunstan via the beautiful Kawarau Gorge to Queenstown, New Zealand's Adventure Capital. There are no major climbs today, but instead, plenty of distractions such as wineries that may tempt us to stop. Central Otago is the world’s most southerly grape-growing region, best known for its stunning Pinot Noir. For those wanting an adrenalin rush, how about a bungy jump from the historic Kawarau Bridge, as you pass AJ Hackett's Bungy's first ever location. Today is a free day in action-packed Queenstown. You could try a fly-cruise-fly package into the dramatic Milford Sound, white water rafting, jet boating, paragliding, helicopter rides and many other options. You could shop in the town centre, relax with a massage, or take an afternoon cruise on Lake Wakatipu on the steamship TSS Earnslaw. However, if you'd would rather clock up some more kms on your bike, you can point you in the right direction. After a day’s rest your legs should be ready for our most challenging climb, the Crown Range. First, a fairly easy ride to the historic gold mining town of Arrowtown, with just one real climb. Then we head to the summit of New Zealand's highest highway (1080 m). It's a hard 3 km up steep hairpins, a flattish 5 km, then a lung-wrenching, leg-burning 3.5 km. Then it's ‘plain sailing’ as we follow the Cardrona River down to Wanaka, a popular lakeside resort town. Relax and enjoy local eateries and sights. There are also plenty of options for extra riding. Lunch included. Heading north, you follow the rugged West Coast coastline for 30 km, with just one small climb before turning inland. Another little hill takes you to scenic Lake Paringa. A flat section through rainforest allows for some recovery until just before Fox Glacier at 120 km. To round off a spectacular day you now have three steep climbs and descents for around 22 km to Franz Josef. The rugged coastal scenery and dense rainforest make today’s ride one of the most scenic of the tour. The perfect finish could be the Glacier Hot Pools, nestled in lush rainforest near the township's edge. Lunch included. After 1283 km of great riding it's time to pack up the bikes and bid our farewells. If you're travelling to Wellington and the North Island, the ferry terminals are close by, and the airport at Blenheim is an easy transfer. For those who wish to return with us to Christchurch, our support vehicle leaves mid-morning for the 5-hour drive via Kaikoura and the East Coast. The Airport of Auckland is the main airport in New Zealand and the most important hub to all dstionations in New Zealand.There are many regular flights to/ from Melbourne, Brisbane, Sydney Singapore, Bangkok, Nadi, Dubai and Tokyo. Domistic flights leave to/from Wellington, Christchurch, Invercargill, Nelson, Queenstown, Dunedin, Hamilton, Napier and other small domestic airports. Shuttle busses leave frequently from the airport to Auckland city center. A free inter-terminal bus service operates every 15 minutes between the international and domestic terminals. Shuttle busses leave frequently from the airport to Christchurch city center. Travel time from the airport direct to the city center is approximately 15-20 minutes. When the tour operator confirms to us. We confirm to you and charge you’re a deposit fee of €750 per person plus a € 15 booking fee.